35. Clickwork is a necessary accessory of the barrel and mainspring; its purpose is to prevent the spring unwinding after winding up has ceased. Since this task is not directly related to the other parts of the mechanism, it is not surprising that a large variety of designs can be found; all of which serve the same purpose with greater or lesser ease of manufacture, or with different degrees of elegance. 36. If simplicity and practicality are required, but mainly if the clickwork is to be sunk into the upper plate, then it seems that a round fitting is preferable. Figure 6. Simple clickwork sunk into the upper plate and completely covered by a cap. The simplest clickwork of this kind consists of a ratchet, click and clickspring (which is circular and surrounds the ratchet) that fit into a sink in the upper plate, with only the necessary gap for free movement of the parts. The click should move on a stud set in the sink, or between two pivots. The whole arrangement should be covered by a cap screwed onto the plate, which can be easily put in position by the aid of a shallow sink around it. A small hole bored in a suitable place on the cap would be useful so that the click could be pushed out when it is necessary to let down the mainspring. It would be hardly possible to make clickwork more simply and more cheaply than this, and it is also totally reliable in operation. 37. 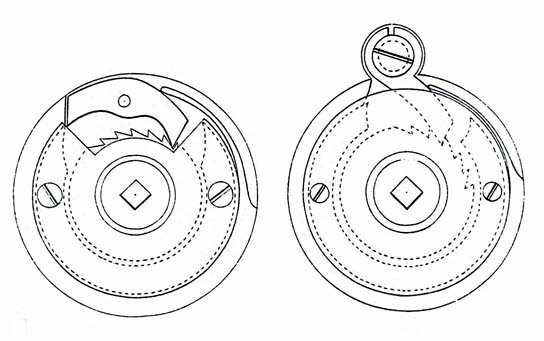 For watches where greater elegance is desired, the click and clickspring can be visibly attached by leaving a small circular ring standing around the sink in which the ratchet wheel sits, and screwing the cap onto this. 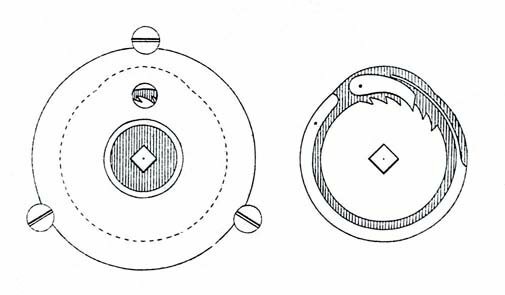 The spring fits into a circular sink outside so that it is only partly covered by the cap, in order to hold it in its place (Fig. 7). The thinner acting part of the spring can be easily turned in an eccentric chuck on the lathe. 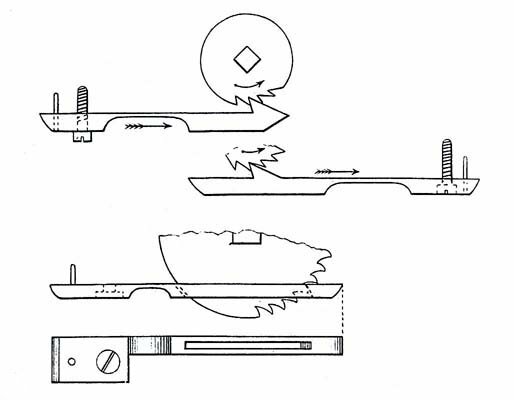 Clickwork sunk into the upper plate; figure 7 with visible parts. The click is held by means of a shoulder screw, whose head is on the lower side of the plate. Since such a screw might break off or loosen, it is recommended that the click sits on a stud in the sink and the screw simply holds it in place (Fig. 8). The cut in the click is for disengaging it when letting down the mainspring. 38. A simplified clickwork has the click and the spring made from one piece, but they break more frequently and then the replacement of the piece causes more trouble. Figure 9. The one-piece round clickspring and click; two types. 39. The material from which the clickwork should be made is hardened and well tempered steel, for the ratchet wheel and click anyway. The spring can be made equally well from another metal which has the necessary springiness, but steel springs are preferable because their polished surface gives the work a brighter appearance. The form of the ratchet teeth is important. We can give them greater strength if the back is not flat but somewhat curved. The working corner of the click will have to be thinner, but it is very easy to relieve it if there is wear. The front face should always be somewhat under-cut so that the back of the adjacent tooth has a sharp corner, and consequently the working surface of the click rests, if possible, on the whole tooth surface. The durability and safe operation of clickwork depends substantially on the good execution of these points. For the safe operation of clickwork is it important that the centre of the click to the point is a straight line tangential to the ratchet wheel circle, or, which is the same thing, that it stands perpendicularly to the radius of the wheel at the point of contact. If we deviate even a little from this direction then it should be only inwards if the click is pushed, so that the angle is more obtuse. However, the reverse is true when the click is pulled. Figure 10. The straight one-piece clickspring and click; three kinds for barrel bridge mounting. Figure 10 shows different straight clickworks that are often used in Swiss watches and against which no objections can be raised if they are well and prudently made.